Learn how to speak the languages of love to the important people in your life. Craving love is among the deepest of human emotional needs. Best-selling author Dr. Gary Chapman has defined and expounded upon the ways people meet each other's needs to feel loved. He is credited with helping millions to save and improve their marriages, by showing them simple and practical ways to communicate love to their partner. 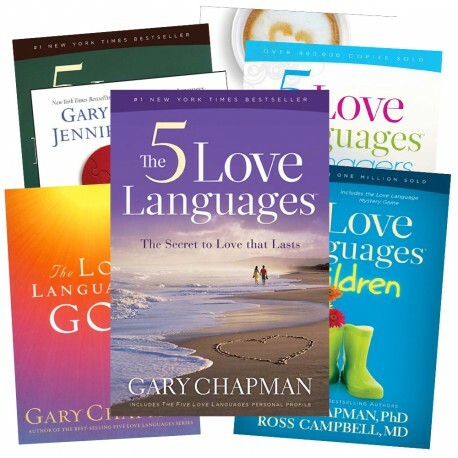 Since the success of his first book, Dr. Chapman has expanded his Five Love Languages series to specifically reach out to teens, singles, men, and children. The Five Love Languages , seven-volume collection includes all of Dr. Chapman's Five Love Languages titles and provides a complete picture of how people successfully speak the languages of love in marriage, to children, friends and co-workers. In his most recent book, The Five Languages of Apology , the language of expressing regret and asking for forgiveness becomes a unifying factor for the Five Love Languages Collection . Just as people have a distinct love languages, they also hear and express the words and gestures of apology in a different language. This groundbreaking study of the way we apologize reveals that it's not a matter of will-it's a matter of how. By helping people identify the languages of apology, a clear path is restored for healing and sustaining vital relationships. Making Marriage Work: It doesn't have to feel like a chore. Emotional love language between spouses may be as different as Chinese from English. No matter how hard one's spouse tries to express love in “English”, the other understands only in “Chinese”, and will never understand and feel expressed love. Communicating love isn't as easy as falling “in love,” because it's quite a different thing. Falling in love is not an act of the will or a conscious choice. It's effortless. In The Five Love Languages keys are presented to help spouses understand each other's unique needs and apply the right principles and language to express love in ways that truly connect. Dr. Chapman presents the primacy of a right relationship with God as it impacts all other human relationships. His goal is to help readers recognize the love languages of God and understand how to express love to God and reflect God's love to others. If a parent's love language is different from a child's, it's the parent's God-given responsibility to learn how to effectively communicate love at the deepest emotional levels. This resource will help busy parents express unconditional feelings of respect and affection that will resonate with children throughout their lifetimes. Never before has the task of parenting teenagers been more perplexing. Despite the peer pressure teen constantly face, studies show it is still parents who influence teens the most. The door to that influence is love. It is the most foundational building block of parent-teen relationships. Through true stories from the counseling practice of Gary Chapman, parents will discover how the principles of the five love languages can effectively work in the lives of teens and parents. Singles can discover the joy of expressing love and feeling truly loved in return. Whether young or old, widowed or divorced, separated or never married, Dr. Chapman's proven principles of communicating and receiving unconditional love apply in all relationships including friends, coworkers, classmates, and roommates. The special application and messages for singles are the result of real-life examples taken from 30 years of interaction and counseling with single adults. Men ready for a richer relationship with their wives will appreciate how this men's edition of The Five Love Languages will help them recognize cues and often confusing signals of how their love is being received. The heartfelt love and renewed commitment resulting from men learning how to express love in ways their wives resonate with is transformational. The real-life stories of men who have mastered the languages of love with their wives are inspirational and encouraging.